Eliminate the Need for Costly ‘Event Driven’ Software! Salescaster Industrial Production Displays eliminate the need for costly ‘event-driven’ PC software to monitor and execute field updates. Our Production Display can be updated by direct input from a PLC serial data or from a Windows Program that can read external files. Salescaster Industrial Production Displays contribute to better efficiency, communication and work place safety within your industrial enterprise. A business informed with real-time information about its employees or customer base can take immediate action and extend the operation to maximum efficiency. 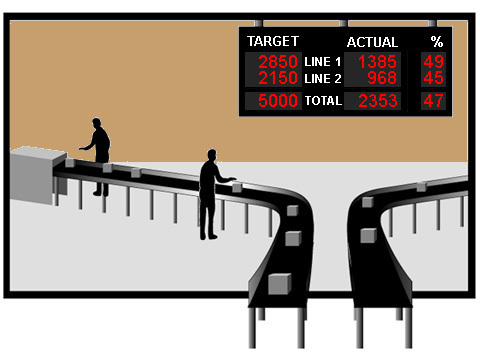 Our engineering staff will accommodated most complex programming fields and configure the LED Display to output automatically the precise Targets, Totals and Statistical Data that your workforce needs. ► Programmable or automated industrial Andon displays and other efficient workplace solutions. ► Display production data in real time. Calculate shift efficiencies and production targets. Link your data to Windows based spreadsheet or database. Formulas are controlled via simple text files. ► Salescaster industrial display signs contribute to better efficiency, communication and work place safety within your industrial enterprise. ► Easily configured through your network using work station or handheld device to display critical information about such topics as your production status or traffic management. ► Call 800 346-4474 to speak with a specialist from our Automation team for further details.